Antonia presented with knee pain for 35 years, nasty light touch allodynia and a love of Facebook games and when she got stuck into Recognise Online it resulted in a very gratifying and challenging clinical experience. Antonia’s knee pain and activity tolerance is now the best it has been since she underwent an open menisectomy and follow-up MUA all those years ago. And she no longer has the light touch allodynia. Antonia (68yrs) did not have CRPS but she did describe intermittent formication, occasional spontaneous pains, constant aching and pain with all active and passive movement. She also described what sounded like mechanical locking of the knee. The weight-bearing x-ray made enough mention of OA for her to be triaged to my OA assessment clinic. The weight bearing x-ray OA changes were perhaps Kellgren-Lawrence Grade 2, mild. When I initially assessed her she rated her worst pain 72/100mm on a VAS; and at the time of the assessment (10am) she rated it at 49/100; she said the knee was always stiff. The pain was a bit better in the morning and was worst in the evening. Any movement of her knee was painful and she described severe light touch allodynia; even the lightest of touches was painful. Stroking a facial tissue across the skin over the medial and lateral knee produced a grimace and withdrawal reaction; over the scar it was worse. She rated the punctate touch of a No 4.46 Semmes-Weinstein Monofilament over the lateral and medial skin as 5/10 on a 0-10 Borg rating scale (on the left knee she rated it as 0.5). Interestingly punctate touch over the scare was numb but dynamic touch was severely painful. A straight leg raise did not provoke her pain and there was no lumbar or hip pain referral. There were no temperature changes, nor abnormal skin quality. The knee looked ‘normal’, apart from the scar. She did not satisfy the criteria for CRPS. I was not able to assess TPD as the skin was too allodynic to the light touch required. Antonia had far from fluent spoken English but her comprehension was quite good; she loved playing games on Facebook and so I thought she may be able to use Recognise Online so I assessed her left/right judgement accuracy and speed. She was able to correctly identify the image of a left foot 40% of the time, in 2.8 seconds and correctly identify a right foot image 53% of the time, in 1.9 seconds. I explained the rationale for using Recognise and gave her the log in codes; I was not all that hopeful about how she would go. The top image is the L (orange) and R (green) accuracy. 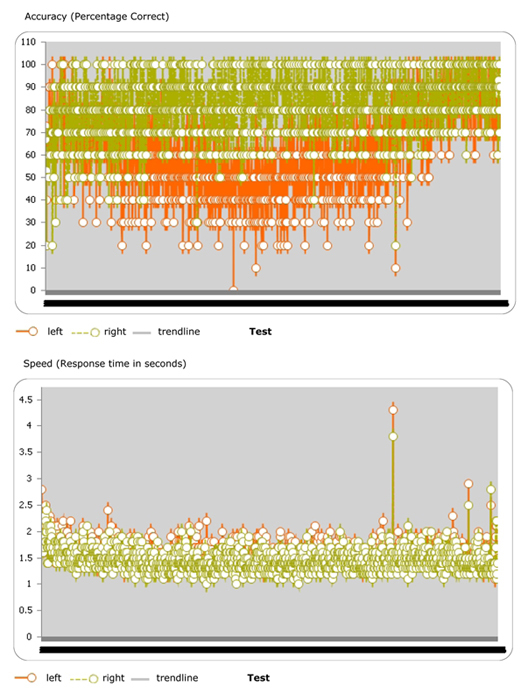 The bottom image is the speed responses with a trend line showing an increase in speed over time from 2 seconds to 1.4 seconds. When I reviewed her a month later she said her pain was much the same; but using stairs was easier. She struggled for three weeks with identifying the contralateral foot; consistently ranging in the 40-60% correct; decision speed reduced to the 1.4-1.6 second range. The online display of the months accuracy results was impressive; she had done lots of sessions; see the attached graph; a clear difference between the sides. Her evening pain was unchanged but at 10am she rated it at 0/100mm and the light touch allodynia had also improved; rating at 3 compared to 5/10 a month previously. After a further two weeks she rated her worst pain at 17/100mm and the pain at the time of the assessment at 4/100mm. Light touch stimulation was normal; the same on both knees (except for the scar which remained quite sensitive). The knee was no longer stiff; active, passive and imagined movement was pain free. No locking, formication or spontaneous pains. The knee pain no longer limited her walking tolerance. The knee was the best it had been since the arthrotomy 35 years before. L/R% and speeds had improved to normal values. I suggested that she continue with the Recognise online; and perhaps also do the more difficult ‘Context’ and ‘Abstract’ images. I also toyed with the idea of adding in some touch discrimination training but decided not to. The daughter said she had spent 35 years telling her husband not to touch her knee; so now to ask him to touch it might be a bit too much. I reviewed her again after a further three weeks; 5 days after her Recognise account expired; and the gains had been maintained; the maximum VAS rating during the previous week was 4/100mm. Including the very first appointment, she had had five sessions in 11 weeks. Is this a clear example of the protective power of pain? Compared to all people I have assessed who had an open arthrotomy/menisectomy 20-30 years ago Antonia’s knee was very well preserved; all the others have been candidates for an arthroplasty. The pain had limited her to light house work; she had done no heavy lifting; squatting or excessive loading of the knee in all that time. When I looked at the Recognise online results in detail I counted up her sessions in the first five days and she had made over 8,700 laterality decisions!!!! She kept up that intensity for the next four weeks; and it was only after three to four weeks that she began to notice a change in symptoms. This comment was so telling for me “she had spent 35 years telling her husband not to touch her knee”. I’m thinking that her neuroimmune representation of her knee was rather impoverished. Thanks Anton, what a brilliant case study. So much to take away from this example that can provide confidence, even with those clients that we might not think will “get” recognise for cultural, language, age or any other reason. I looked at the recognise graphs and thought “wow, this is form of progressive art linked to a person’s sensitivity, especially as Antonia slowly gets more and more accurate”. The case study shows just how important persistence and patience is. We have heard of a number of elderly people who have worked hard on the imagery and avoided surgery which in some cases would have been dangerous because of other health issues. What we find important is that knee OA has always been considered a peripheral and structurally based disease yet these well executed clinical findings support recent research findings suggesting that central sensitisation is a component of many ongoing knee pains (Stanton TR et al 2012 Rheumatology (Oxford) 51: 1455). Clifford Woolf (2011 Pain 152: S2) also has a summary of research papers indicating the same. Did Antonia show patience and persistence or doggedness and doggedness? She persisted for three weeks with little apparent reward. If the first five days are indicative she did about 80 episodes of 20 images per day. For about 25 days before she may have noticed some changes in symptoms. Did she have to do that many decisions to force a change in her sensorimotor ‘map’; or in the connections between that map and other brain centres? In hindsight I think it could be likely that she did have to do that many repetitions; she did far more than I asked or suggested that she do. Did she do more repetitions than are usually prescribed in GMI? It has reminded my of the persistence in ‘Cognitive exercises’ that Barbara Arrowsmith-Young did to ‘re-programme’ parts of her brain; as she describes in her book; ‘The Woman That Changed Her Brain’. Initially she could not tell the time by looking at a clock face. In order to use a clock face for time telling she did clock face recognition exercises for 8-10 hours a day; for weeks. When the clock face recognition skill eventually improved she found some other cognitive deficits improved as well. If a patient has weak quadriceps and poor balance and co-ordination and they are given an ineffective exercise programme, and they do not improve; do we conclude that exercise is not going to make a difference? Of course not; if Antonia had come back to me after a week and I knew that she had done so many repetitions and her knee was no better, I may have suggested that she had done enough to give me an idea as to if the cortical exercises were going to make a difference. Fortunately there was miscommunication and misunderstanding regarding her review appointment and she continued with the Recognise exercises for the whole month; without any interference from me. We readily recognise the shortcomings in a poor ‘strengthening’ exercise programme but do we recognise it in a ‘failed’ cortical ‘strengthening’ exercise programme? Training and refining a high level physical skill; ie doing a gymnastic floor routine or complex dance and ballet routines requires lots and lots and lots of practice and rehearsal. Maybe there are instances when very very high repetitions are required in sensorimotor and pre-sensori- pre- motor cortical exercise programmes in the management of some pain presentations. I would be very interested in your comments and in those of others in this community of therapists. This brings up a few clinical issues that we are grappling with. I am wondering if you asked her why she kept going – were other other things changing, did it feel like the right thing for her to do? I also wonder “how much brain” has to change before any measurable outcome changes on recognise are evident. And doggedness – when there is nothing else therapeutic on offer, sometimes doggedness, more than patience and persistence keeps them going. 20 images at 5 seconds x 80 reps is more than than the two hours of left right discrimination that Moseley used in the 2006 RCT – perhaps 3 hours of work. it doesn’t seem too over the top considering her history and maybe we need a form of recognise bootcamp for some? A few weeks ago I serendipitously heard Norman Doidge on the radio talking about his latest book ‘The Brain that Heals Itself’ and he highlighted the experience of Michael Moskowitz, a pain physician who used mental imagery exercises to eliminate the neck and arm pain that he had experienced for 11 years (since a water boarding accident). Moskowitz said that it was only after 3-4 weeks of dogged and repetitive mental imagery training/exercises that his pain began to subside and over several more weeks he no longer experienced the pain. And it has not returned. The interviewer asked if the change in pain was a result of placebo effects; Doidge was emphatic in saying this was certainly not the case; it was due to a multitude of changes in the brain. The reason for this post; so long after the original one; is that the time frames related by Moskowitz reminded me of the time frames for change experienced by Antonia. I was also struck by the thought that if someone did four weeks of challenging and progressive weights training; would we ask if the change in strength and endurance achieved was due to a placebo effect; of course not.